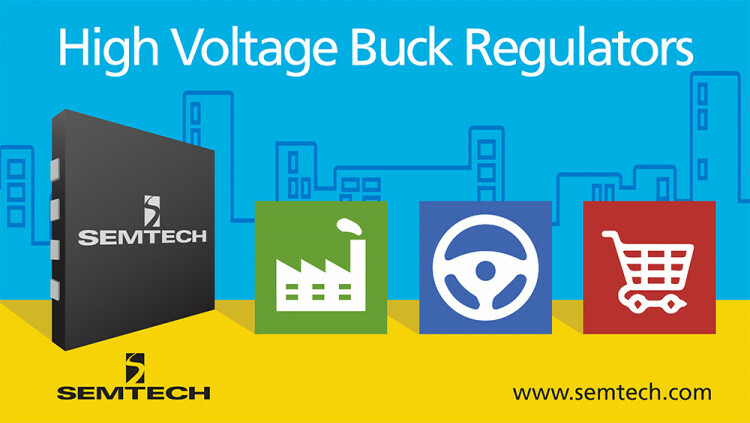 Semtech Corporation (Nasdaq:SMTC), a leading supplier of analog and mixed-signal semiconductors, today announced the extension of its high voltage power management platform with the new TS3004x family of integrated switching buck regulators. The new product family is geared toward high-performance applications requiring up to 40-volt input range in a wide range of markets such as industrial, telecommunications and consumer. The TS3004x product family is comprised of the TS30041 and the TS30042 DC/DC synchronous switching regulators. The products include integrated power switches and robust fault protection features for small footprint and advanced power management in high voltage applications. Applications for the TS3004x product family include industrial and telecommunications power supplies, factory automation, automotive, and other industrial applications. The TS30041 and TS30042 (order codes: TS30041-M0xxQFNR and TS30042-M0xxQFNR) are available immediately in production quantities and are priced at $0.44 each in 1,000-piece lots. Semtech offers comprehensive design assistance, including field- and factory-based support. Data sheets, volume pricing, and delivery quotes, as well as evaluation kits and samples, are available at www.semtech.com/info.